This is the presentation I gave at the Illinois Medieval Association's Reframing Medieval Bodies Conference on February 17, 2018. In this paper, I will discuss the use of Viking and Norse imagery used in the nineteenth-century women's rights movement in the United States. I will discuss four different authors and the texts in which these references were used, look a little at their sources and do some compare and contrasting as to how this imagery was used. 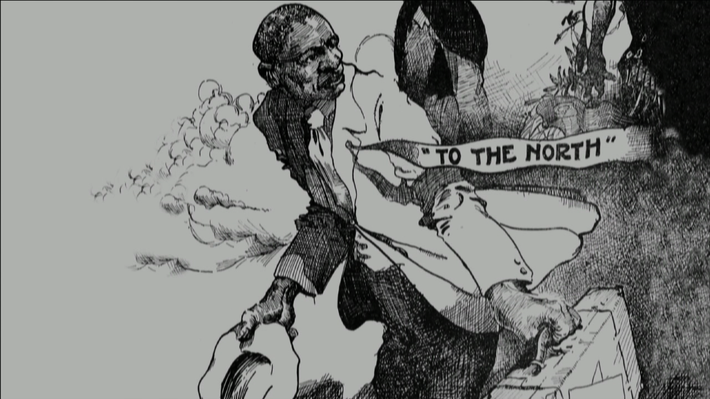 I will then discuss how these same images eventually came to represent something much different near the end of the twentieth century--that of white racism in the United States. But first: some background information! Prior to 1837, very little was written about Vikings and Norse literature in the U.S. There were a few exceptions: Washington Irving, Benjamin Franklin and Thomas Jefferson all made some slight references in their musings. Henry Wheaton wrote a book called The History of the Northmen in 1831. So, some Americans knew a thing or two about Vikings. 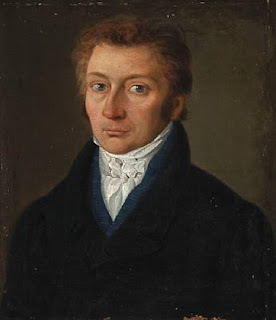 In 1837, however, a prominent Danish scholar by the name of Carl Christian Rafn published a text, Antiquitates Americanæ. In this text were some Latin translations (that were soon after translated to English) of the Vinland sagas. For those of you that don't know, the Vinland sagas refer to two medieval Icelandic sagas: Eiríks saga rauða and Grænlendinga saga (The Saga of Erik the Red and The Saga of the Greenlanders). These tales describe the Icelandic settlement of Greenland, as well as the Greenlandic expeditions to the North American continent, which had been called Vinland by the Norse explorers. Rafn, in essence, told Americans to the fact that Europeans had visited the continent 500 years before Columbus. Naturally, this caused quite a stir (Kolodny 2012: 111). Right away, writers began working Rafn's information into their own works. Some authors simply parroted the information on Vinland while other popular writers, such as Henry Wadsworth Longfellow and James Russell Lowell worked a few of Rafn's Norse "artifacts" into their poetry. So for the first time the Viking-American past was introduced into popular culture. Rafn's text, however, came at a very interesting time in the U.S. The 1830s and 40s were an age of reform (Curti 360). 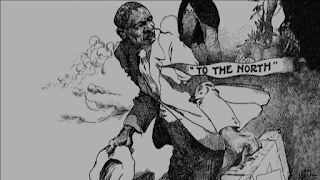 The abolition movement was gaining steam, workers were pushing for more labor laws, and the push for women's suffrage was in the beginning stages of its organization. And so activists incorporated this new-tapped information inspired by Rafn into their political writings. This, of course, included the women's rights movement. The beginning of the women's suffrage movement in the U.S. is traditionally placed at Seneca Falls, NY, in 1848 with the Congress put together by Elizabeth Cady Stanton and Lucretia Mott. 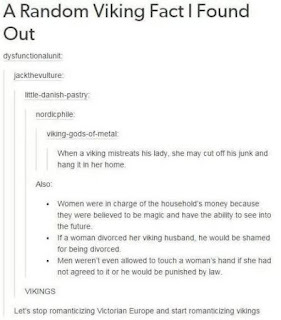 It is important to note, however, that none of these major players (Stanton, Mott, Susan B. Anthony) ever used Norse imagery in their writings or lectures. So the authors that I will be discussing are smaller players in the movement. Their texts, too, are not typically considered with the corpus of feminist writing (with the possible exception of Margaret Fuller's), and the references to Norse imagery are very small in comparison to the overall content of the texts (with the exception of Marie A. Brown's). So we are talking about very brief references in the periphery of the overall discourse on women's rights. But I think that these are particularly important because of what they grew to represent in the twentieth century. The first woman I would like to discuss is Margaret Fuller (1810-1850). She was a literary critic, writer and editor from New England who eventually found herself in a prominent position within Ralph Waldo Emerson's transcendental circle, having even served as the editor of The Dial for a brief time (Madison 434-437). She published what is considered one of the first feminist texts in the United States, Woman in the Nineteenth-Century, in 1845. She argues in the book that somehow through the ages, women had lost their status as equal with men. She then discusses ancient and medieval cultures, histories and myths in an attempt to show that older cultures treated women much better than in the U.S. She uses the story of Iðunn from Norse mythology as an example. In this story, the male* trickster god Loki marries Iðunn off to a giant. When the rest of the Æsir (gods) discover Iðunn's absence, they are distraught and unhappy. They force Loki to rescue her from Giantland, which he does by transforming into a bird. She too transforms into a bird, and they both come soaring victoriously back to Asgarð. Curiously, Fuller does not focus on the deceit of the male god, nor on the weakness or helplessness of Iðunn herself. Instead, she focuses on the emptiness the gods felt in her absence. With her gone, "discords arose and love grew cold." (Fuller 191-192). A noticeable imbalance was felt. Fuller used this analogy to describe the chaos in the U.S. at that time. Without woman in her natural place beside man--both as equals--the tumult of the nineteenth century would continue. She then beautifully sends an invitation to women everywhere to reclaim their lost status: "We must welcome her form as the speck on the sky that assures the glad blue of Summer. Yet one swallow does not make a summer. Let us solicit them in flights and flocks!" (Fuller 192) In her mind, if women could regain what they had lost, it would right the imbalance, usher in a new era of American-prominence, and allow the human race to fulfill its perfect nature as transcendent spirits. (Fuller 190-191; Miller 7-8). This romantic look at past cultures is a common thread in each of the texts that will be discussed. And like Fuller, Colby found inspiration in Norse mythology. Yet, she moves from the goddess of youth (Iðunn) to the god of war (Oðinn). She also says that Sigrdrifa is "one of the noblest conceptions of the character of woman in all of literature." (Stanton 31) Sigrdrifa is a Valkyrie from the Eddic poem Sigrdrífumál who imparts wisdom upon a male warrior. (Neckel 186-192) This was a very powerful image of a man who was dependent on a powerful female character. Valkyries are also associated with war and battlefields, so even though Colby is still citing Norse mythology 50 years after Fuller, the tone feels more serious. It feels as though the stakes have been raised. Due to the nature of The Woman's Bible, it felt as though some blame for the loss of women's status was directed towards the Church. Matilda Joslyn Gage, an activist from New York, came out and boldly claimed it was the Church's fault. 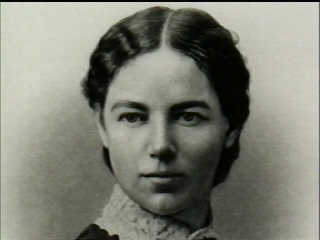 Her scathing 1893 text Woman, Church, and State blamed Christianity for the poor treatment of women. She accused Christianity of "restricting the liberty woman enjoyed under older civilizations." (Gage 7) Once again, we see the belief that women were provided better treatment in past cultures. Instead of referring to Norse mythology, however, Gage cites Grágás, a thirteenth-century Icelandic law code. She says that the Old Scandinavians protected women much better with their laws. (Gage 20) There are two important distinctions in Gage's approach: firstly, Fuller and Colby were still operating within a Christian narrative. By that I mean Fuller, as a transcendentalist, wrote her text to some degree as a religious demonstration against close-minded Calvinists. (Morison and Commager 520-521; Miller 8) Colby's addition, though discussing myths from other cultures and religions, was part of a Biblical commentary meant to edify. Gage, however, stepped away from Christianity and assigns it as the main culprit for women's woes. The second distinction is that in using a law code rather than myth, Gage is bringing Old Norse references out of a mystical past and into a practical history. Laws are concrete; here, then, is concrete and real proof of a culture's support of women, which can display their eventual fall from grace. 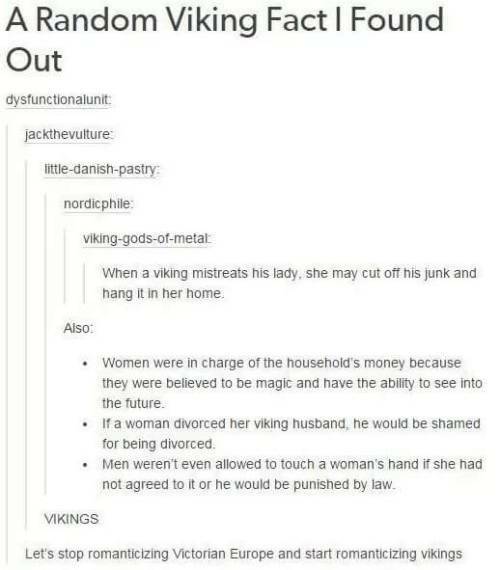 This last point is especially important because it was not just Brown who saw herself as an extension or descendant of these freedom loving Vikings. (Brown 41) Each woman I have discussed has attached herself and the American people either to these medieval Scandinavian explorers or to a wider Teutonic race. And in each text, there are traces of subtle racism. For Fuller, it is simply what I refer to as "Anglo-Saxon chest-beating"--this sort of pride in the Anglo-Saxon race that spills forth from Emerson's English Traits. ** Gage and Brown, on the other hand, engage in the ongoing feud between Northern Europeans and Southern Europeans in America. Because "freedom-loving" Northern Europeans were jockeying for position and status over the influx of Southern European immigrants in the nineteenth century, the American foundation myth became a battleground. Columbus belonged to both a Latin race and to the Catholic Church, both of which were blamed for degradation of women. The Vikings, then, were pulled into this battleground as the proper racial founders of America. Though many of the white racist groups are dominated by males, many women-led groups exist in the racist counter culture. And some of these groups were inspired by the exact same imagery described by the women pushing for equality in the nineteenth century. Colby's noble character Sigrdrifa became the name of a publishing company for the Women for Aryan Unity (WAU)(Lethbridge) Other publishing companies reflect the same inspiration of Valkyries and goddess (The Valkyrie Voice/Freya's Homepage). (Blee 141) In a recent interview with Harper's, alt-right activist and pagan Lan Lokteff likened the women of the alt-right movement to "shield maidens and Valkyries." She also laments the fact that "female independence has undermined Western civilization." (Darby 1) Lokteff is using the exact same imagery as Colby to the opposite effect. Colby uses the Valkyrie Sigrdrifa as an example of the type of independence and status that had been lost and must be regained; Lokteff, on the other hand, uses the Valkyrie image to represent women who long for the days when there was less independence available. So what the heck happened? How did this transformation take place? From the moment Rafn introduced America to its Norse past, Vikings were tied to race. Emerson and William Gilmore Simms had a kind of verbal tug of war over the issues of abolition and race while referring to Rafn and to Norse literature. (See my MA thesis, also a lot of this information came from the brilliant Annette Kolodny!) The Vikings were used if not as racial then at least ethnic ammunition in the nineteenth-century battlefield between Northern European immigrants and Southern European immigrants in the United States. Also: The suffrage movement was mostly about white women! Let's be honest! Though some African American women participated in the the suffrage movement, their right to vote was not secured until the 1960s. *** Many white women were reluctant to participate because of the issue of abolition, and even Stanton and Susan B. Anthony struggled with the issue of race in the women's rights movement. (Marilley 160-171) So the imagery used represented white women, and, more to the point, white Anglo-American women. Industrialization and urbanization also created in the U.S. a romantic view of a golden age, when men were real men--freedom loving men, like the Vikings, who didn't need cities or technology, and women were well behaved. Similarly, the mass black migration from the south to northern cities created so much racial anxiety in whites that the vague lines separating the Northern European and Southern European sides eventually began to fade, creating one white race. (Gardell 41-42) With the threat of a new "Other" in the U.S., the distinctions between white races became less important. That subtle racism that existed in the texts from the nineteenth century grew NATURALLY into outright racism. Thus, the medievalism and the Norse imagery seen at Charlottesville and elsewhere in the U.S. should not be surprising at all! Odinism and ethnic-pagan religions have dug their claws so deeply into these Norse ideas and images that nowadays one has to hesitate when a Hammer of Thor is hanging around someone's neck. This is due mainly to Else Christensen's introduction of Norse-paganism into the United States because it was mostly a guise for her "racial rejuvenation" movement. (Gardell 171) And though the nineteenth century texts were peripheral, the modern conceptions of Vikings as our brave white ancestors is extremely mainstream. Whether is is exciting Minnesota Viking fans recreating some sort of "tradition" before a game, or the white hero who saves the Native Americans in the film Pathfinder (2007), Vikings in the U.S. have come to represent specifically white people, with a tinge of racism that cannot be fully removed. After the events of Charlottesville, many medievalists sprang to defend the field from white supremacy. **** I applaud and support this! It is my belief, however, that in order to better understand how to deal with this disturbing relationship of racism or white supremacy and the Middle Ages, one must go back and trace its reception. Understanding how we arrived at this point will undoubtedly give a clearer perspective of where to go next. This relationship between Vikings and racism did not spring up out of nowhere. It was sown during the Victorian era, was watered by the Nazis, and is now being sown by American racists. It is important in the age of Fake News and Alternative Facts to understand the evolution of Norse imagery in the United States so that it will more difficult for others to misuse it. *I realize that Loki's gender is a matter of debate, but here he is presumed to be male as his character and pronouns suggest. ****See for instance Andrew B.R. Elliott's article "A Vile Love Affair: Right Wing Nationalism and the Middle Ages" and Dorothy Kim's blog post, "Teaching Medieval Studies at a time of White Supremacy." Blee, Kathleen M. Inside Organized Racism: Women in the Movement. Berkeley: University of California Press, 2002. Brown, Marie A. The Icelandic Discoverers of America: Honor to Whom Honor is Due. Honolulu: University Press of the Pacific, 2014 (Reprinted from the 1890 edition). Curti, Merle. The Growth of American Thought. New York: Harper and Row, 1964. Edda: die Lieder des Codex regius nebst verwandten Denkmälern, Volume 1, edited by Gustav Neckel. Volume 9 of Germanische Bibliothek: Untersuchungen und Texte. Carl Winters Universitätsbuchhandlung: Heidelberg, 1914. Fuller, Margaret. Essays on American Life and Letters. Ed. by Joel Myerson. Schenectady: College & University Press, 1978. Gage, Matilda Joslyn. Woman, Church & State: A Historical Account of the Status of Woman Through the Christian Ages: with Reminiscences of the Matriarchate. Chicago: Charles H. Kerr & Company, 1893. Gardell, Matthias. Gods of Blood: The Pagan Revival and White Separatism. Durham and London: Duke University Press, 2003. Kolodny, Annette. “Gudrid Thorbjorndottir: First Foremother of the American Empire.” In Women’s Narratives of the Early Americas and the Formation of the Empire. Edited by Mary McAleer Baulkun and Susan C. Imbarrato. London: Palgrave MacMillan, 2016, pp. 9-32. Kolodny, Annette. In Search of First Contact: The Vikings of Vinland, the Peoples of Dawnland, and the Anglo-American Anxiety of Discovery. Durham and London: Duke University Press, 2012. Madison, Charles A. “Margaret Fuller: Transcendental Rebel.” The Antioch Review 2, no. 3 (Autumn 1942): 422-438. Marilley, Suzanne M. Woman Suffrage and the Origins of Liberal Feminism in the United States, 1820-1920. Cambridge: Harvard University Press, 1996. Morison, Samuel Eliot and Commager, Henry Steele. The Growth of The American Republic, Volume 1. New York: Oxford University Press, 1957. Stanton, Elizabeth Cady, ed. The Woman’s Bible: Part I: Comments on Genesis, Exodus, Leviticus, Numbers and Deuteronomy. New York: European Publishing Company, 1895.